Rovio’s been teasing a brand new Angry Birds title for a while now, but it’s only recently that the company revealed the first screenshot showing the game. Called Angry Birds Stella, the upcoming game seems to be a classic Angry Birds - with a slingshot, piggies stacked up in defensive structures, and so on. This isn’t an RPG (like Angry Birds Epic), and neither a kart racing game (like Angry Birds Go!). 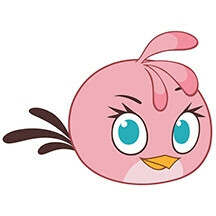 Alongside Stella, which you may already know from previous Angry Bird adventures, the upcoming game will introduce new female characters, including Gale, Willow, Dahlia, and Poppy. There’s also a “baby” called Luca. Each character will bring its “own awesome powers” to the game. If you just can’t wait to play this, you’ll be disappointed to find out that Rovio isn’t planning to release the game before the fall (an exact launch date wasn't provided). There will also be an Angry Birds Stella animation series debuting on ToonsTV this November - so we assume that the game itself will be out by then. Right now, everything looks a bit too Disney-ish to us. But we'll see what the game has to offer when it's finally available to download. Man when will this Angry Birds fad finally end...?